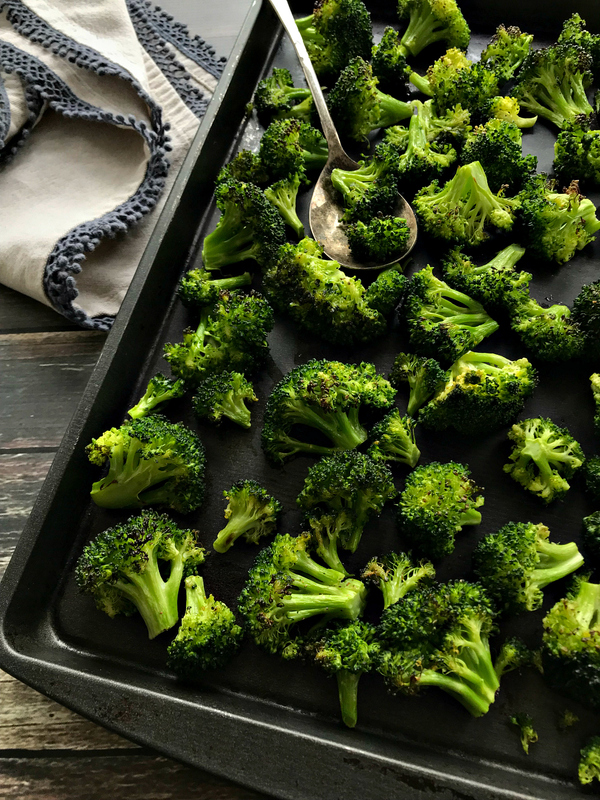 Oven roasted broccoli is deliciously addictive, oh so easy to prepare, and will quickly become a family favorite! The first time I had roasted vegetables was the first time I realized how amazingly delicious they could be. I feel the need to say I’ve always loved veggies and ate an abundance growing up – just never roasted. When you roast vegetables at a high temperature it caramelizes the sugars and creates an amazing depth of flavor. The edges get deliciously charred and crispy, and it’s absolutely addicting. When I make any roasted veggie (not just broccoli), I make a huge pan. The leftovers make great omelets or a healthy snack, so I always make extra for quick and easy meals. You can also toss them with cooked pasta, a little extra olive oil, crushed red pepper, and some Parmesan for a super quick, nutritious, and filling meal! 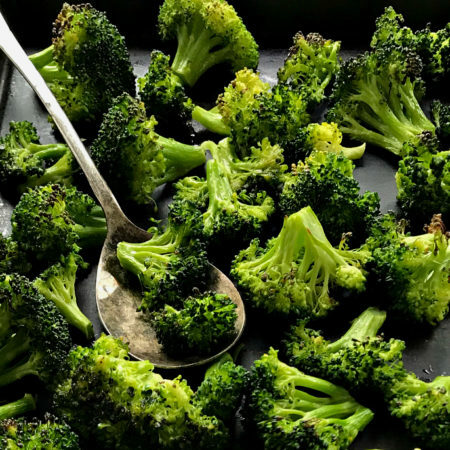 Once the broccoli is done, you can change it up by adding a squeeze of lemon, red pepper flakes, herbs, pine nuts, or Parmesan. Oven roasted broccoli with garlic and parmesan is extra delicious. 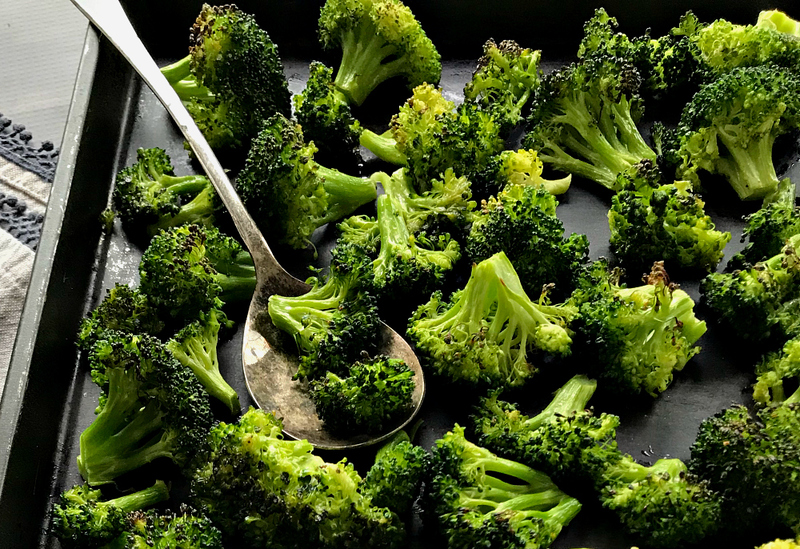 You can toss the broccoli with the olive oil and seasonings right on the pan, but I like to do it in a big bowl and then spread it on a parchment lined baking sheet for easier cleanup. The parchment paper protects the pan and ensures nothing sticks. If you like crisper vegetables, reduce the cooking time be a few minutes. And, if you’re like me and like extra charred edges, just crank the oven up in the last five minutes of cooking. Don’t crowd the pan. Leave a little space between the veggies for better browning. Try to cut the broccoli the same size or as close to it as possible. It will cook more evenly. Be generous with your oil but don’t go crazy. For a large baking sheet, I use 2-3 tablespoons. A sheet pan with a low rim works best because it allows the water to evaporate better. Rotate the pan halfway through cooking for more even browning. Wash and dry the broccoli thoroughly. Add all the ingredients to a large bowl and thorough toss to combine. Pour onto the prepared pan. 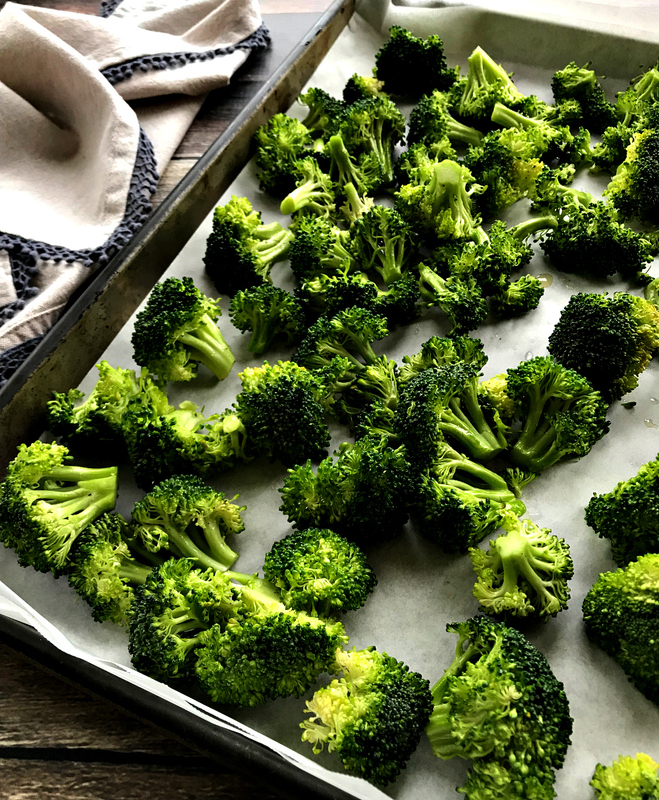 Bake for 12 to 15 minutes or until the broccoli is tender and lightly charred on the edges. This recipe can be doubled or tripled. Just be sure not to crowd the pan.